For years, Ryder Carroll tried countless organizing systems, online and off, but none of them fit the way his mind worked. Out of sheer necessity, he developed a method called the Bullet Journal that helped him become consistently focused and effective. When he started sharing his system with friends who faced similar challenges, it went viral. Just a few years later, to his astonishment, Bullet Journaling is a global movement. This special boxed set includes an exclusive "Stealth edition" of the official Bullet Journal, printed by Leuchtturm 1917. It features all the details of the original Bullet Journal notebook, with the addition of lux black gilding, lead and end pages, and a gusseted end pocket. Ryder Carroll is a digital product designer and inventor of the Bullet Journal. He's had the privilege of working with companies like Adidas, American Express, Cisco, IBM, Macy's, and HP. His work has been featured by The New York Times, The Los Angeles Times, Fast Company, Bloomberg, Lifehacker, and Mashable. Ryder Carroll did a wonderful thing when he told the world about his journaling and productivity method. I first encountered it a year and a half ago when I was struggling with digital fatigue. I needed a system that'd help me keep track of my life without an over dependence upon my iPhone. In my search, I stumbled upon Bullet Journaling, something I had remembered seeing briefly on Lifehacker. I learned the method and quickly made it a part of my life. In the time that's followed, I've since experimented, failed, and started again. 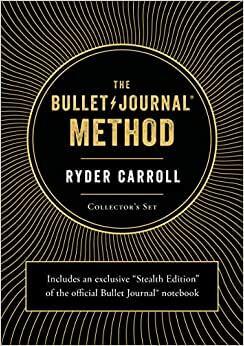 So, it was a joy when I found out Ryder had written the Bullet Journal Method. Having read the website & blog, I at first hesitated to order the book, thinking it wouldn't have anything new. I bit the bullet (pun intended) and ordered the Collector's Set on Amazon pre-order, since I was in need of a new BuJo in the coming months & could get both the book and a new journal for what I'd pay for a journal. I'm glad I did. As an experienced Bullet Journalist, this book was a fairly quick read (one week, reading in the evenings and during lunch). It recapped a lot of what I already knew about Bullet Journaling, but it went deeper. Ryder uncovered a lot of the philosophy behind his methods and even clarified some things that had been a bit foggy (such as taking notes in the Daily Log). Once you get past the basics, the Bullet Journal Method gets into the nitty gritty of journaling and making it your own, which I enjoyed. It was nice to see his thinking, which will help me with a few projects I have on my plate. I won't spoil anything, but I will say this book is well worth the read. If you're curious about what Bullet Journaling is, this book is for you. If you're an experienced Bullet Journalist, this book is also for you. If you're somewhere in-between, this book is definitely for you. This book will proudly remain a staple on my bookshelf and I can see myself referencing it often for a refresher on advanced methodology, as well as the basics. 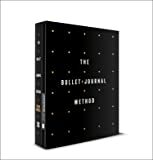 The Bullet Journal Method is not only a great read, it's a book worth owning. 5.0 out of 5 starsIf u dont do a BuJu - you should. I started this Bullet Journal system in Nov of last year. I'm on my 3rd one now as of Nov 1, 2018. I left my career after 50 + years as a Realtor, to run interference for my wife who came down with cancer. With over 200 kinds of cancers and lots of alternative suggestions along with multi diets, juicing, vitamins and the introduction of medical cannabis - keeping track of all the doc's - treatments - appointments THIS System was the best of all. I have ADHD at 73 it is still with me. Try the system, if its not working for you - pass it on. Just got mine in the mail today and inhaled the first half of the book. Ryder's writing style is easy to digest and kept me interested. It was great to see him go more in-depth with some of the things that he's touched on over at his website. The second half of the book really gets more into the philosophy behind the method. I ran out of time to read through it today, but I look forward to digging into it. The journal that came in the boxed set is a high-quality 1917 with the Bullet Journal logo and really slick-looking black gilding. Never seen that before. I started bullet journaling in a B5 sized notebook, so I'm interested to see what it's like in this smaller format as intended by the creator. 5.0 out of 5 starsTotally impressed!!! The box set arrived today. Includes both Ryders Book and a Bullet Journal. I started reading the book and couldn't put it down, Im half way through it and will pry finish it tomorrow. Can't wait to get started with my bullet journal. After what Ive read so far I now understand why I was so frustrated in the past trying to find a calendar/journal that I liked and would work for me. This system makes so much sense I know I am going to love it! 3.0 out of 5 starsGreat book, awful paper in the journal, useless box...just buy the standalone book. I’ve been an advocate of bullet journaling for a few years now. 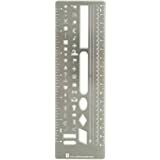 The system has been an invaluable tool for keeping myself organized and to help cope with anxiety. My mind tends to try and juggle a myriad of thoughts, conversations, projects, lists, considerations, appointments, etc. at once; having a space, an external brain, as it were, to collect all of those time-and-energy gremlins and contain them allows me to focus on what’s important in the moment, without worrying about forgetting important tidbits for another, less pressing, matter or feeling bad for not giving a subject the attention it deserves. I know everything I need wil be in my journal, and I can just let them go, for the now. Ryder’s book is a fairly comprehensive instructional to they system that is as much as it needs to be, without bogging you down in the unnecessary. One suggestion though: Ryder asks you to construct your journal as you read through the book; I would instead read through all the way once, and then leaf back through the book and set up your journal. I simply find it useful to step back and consider his instructions before putting pen to paper. The book is a 5 of 5 for me. Especially if you’re new to bullet journaling and it seems a bit overwhelming. The rest of the set, well, not so much. I’m more like the author, Ryder Carroll, in my utilitarian/minimalist approach than most of the beautifully penned bullet journals you’ll see spread across the web. As such, I have only a few requirements in my journals, but they are paramount. At first blush, the journal seems to have it all: 238 usable pages (plus the 4 page in-built index), pagination, dot grid, 3 bookmark ribbons, instructions for beginners... but it lacks in one crucial department: paper weight. If you’re familiar with the Leuchttrum 1917 this will come as no surprise, as this journal is just a branded version of that one. While the paper is smooth and absorbent, it’s also far too transparent. At 80g/sqm, the pages simply aren’t thick enough to prevent bleed-through and ghosting. I use two pens in my journal, both fountain pens: a Fine steel-nibbed Lamy Safari for layout work against a straight-edge and a Fine gold-nibbed Lamy 2000. Both contain the same custom blue-black ink and neither of them are particularly wet pens. Still, you can clearly see in the photos ghosting on the backside of the previous sheet and, increadibly, even through the entire next one: you can read the previous page through the current one! I’m honestly not sure what writing instrument you could use in this notebook and not have a ridiculous amount of ghosting; a pencil maybe? The ghosting in this notebook makes it completely unusable to me. 1 of 5 stars on the journal. Lastly the Collectors Edition Box: ...why? It holds the book and the journal, but if you’re using the journal correctly, it will never go back into the box, except maybe for once it’s full and you’ve retired it. I tend to store my old journals in chronological order, however, so I don’t see the use of a dedicated box for this one. It is just a cardboard box, though, so no problem breaking it down and recycling it. All things considered, just get the standalone book and find a notebook with thicker paper.